Yesterday a new patch hit the Public Test Region (PTR) which highlighted big changes to both D. Va and Mercy in Overwatch. D. Va has been given a new ability and a nerf to her Defense Matrix and Mercy has been completely reworked and given a new ability and different ultimate ability. Before I get to talking about these changes I want to preface with some information about me so that you can be sure that when I say these changes affect me, I mean it. I main Mercy and between both PS4 and PC versions of Overwatch I have roughly 140 hours of experience playing her. She has been one of my main characters since the game’s release last year and is now my most played character by almost 100 hours. D. Va is my second most played character right now and I have roughly 50 hours of experience with her. These are both my most played characters and thus these changes really hit me hard, for better or worse. Developer Comments: D.Va’s Defense Matrix uptime has proven to be too strong, but simply reducing it without making other changes would make her too weak (and far less interesting to play). Instead, we’re adding a new ability, and giving her the ability to fire while flying. 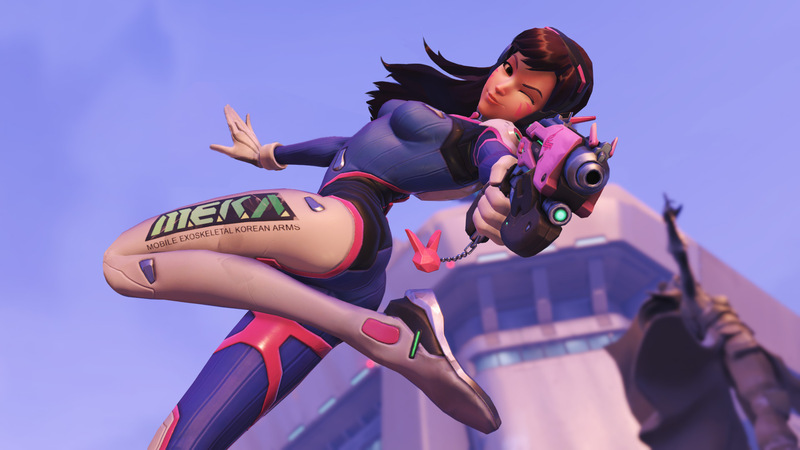 These changes give D.Va a lot of new options while maintaining Defense Matrix’s ability to shut down big enemy attacks. Developer Comments: While resurrecting downed allies is a core part of Mercy’s gameplay, the way her Ultimate functioned was causing a number of problems. It was frustrating to play against, and it incentivized Mercy players to hide away from important battles, instead of taking part in them. This version turns Resurrect into a single target ability. It’s still an important part of Mercy’s kit, but plays much better for both Mercy players and her enemies. Valkyrie, her new Ultimate, gives her the opportunity to make big game-making plays and opens a number of new options for her. So there you have it. D. Va has been nerfed or buffed depending on who you talk to and Mercy has been reworked into an entirely different character. I have a lot of feelings about these changes and I was able to get into the PTR yesterday and test them for myself, so I’d like to share with you my thoughts and opinions on the matter. I personally love the changes that are coming to D. Va and I really plan to play her a lot more than I already do once these changes go live. However, a lot of other D. Va players disagree and consider this a major nerf that, in a way, hurts her as a character. The main reason people are upset is because of the nerf to Defense Matrix’s (DM) duration. Now that it is depleted twice as quickly as before, she will no longer be a “DM bot”, or have the ability to hold DM for a long time while their team attacks uninterrupted by enemy fire. DM was mostly useful when the enemy team used ultimate abilities as she was able to block most of them for their entire duration. There are two sides to this, and all in all I think this nerf is fair. People who played against D. Va were becoming frustrated that their ultimate attacks became worthless as soon as she faced them and held DM up. This became a major aspect of playing D. Va and honestly I never really liked how her playstyle was centered around DM rather than attacking and pushing the enemy team back. With these new changes, she is way more of an attacker than a defender and this fits my playstyle perfectly. She now has the ability to fire her Fusion Cannons (main weapon) while Boosting, making her Boost a more lethal ability rather than an ability meant to get you out of danger. She also has been given a new ability, Micro Missiles, which are a small barrage of missiles fired on a cooldown. I didn’t feel like these Missiles did a ton of damage on their own, they definitely aren’t a one shot ability, but she can fire her Cannons while firing the Missiles which can make them relatively devastating when used properly. She will be able to be played in a way more aggressive fashion which, as I said before, I absolutely love. To me these changes are an overall buff to her and will allow me, and others of course, to play her in a more offense heavy style and I think that it’s a fair change considering we already have characters like Reinhardt and Zarya who are defensive tanks. Now D. Va is along the lines of Roadhog in how she can soak up damage due to high HP but also can do a ton of damage when used properly. The changes to Mercy are considered a rework considering she has a new ability and a new ult which will change the way she is played. This rework is seemingly either loved or hated by the community and I’ll admit that I appear to be in the minority on the side that is disappointed with these changes. 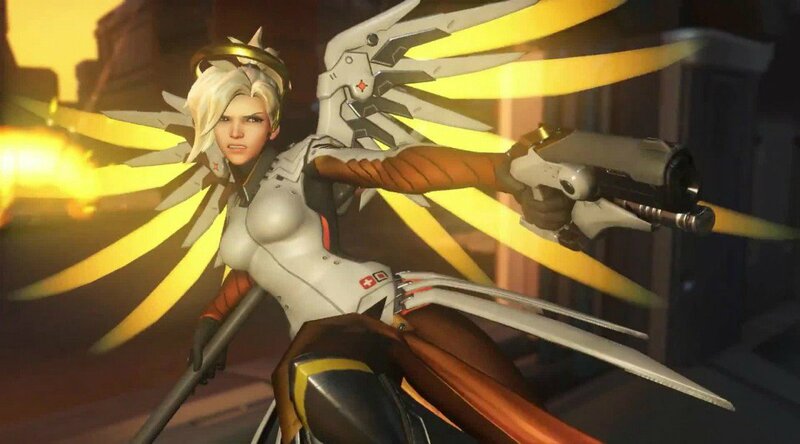 Previous to this rework, Mercy was Overwatch’s only dedicated healer. This means that while she does have the ability to fire a damaging weapon, her main ability was healing her team, providing a damage boost and using her ultimate ability to Resurrect multiple fallen enemies. Every other healer has the ability to damage the enemy and provide healing equally, for the most part. Ana, Lucio and Zenyatta’s kits are all tailored to healing their team while damaging the enemy in some way. Mercy was the only character who actually had to switch weapons to do damage, meaning that her Caduceus Staff was her bread and butter; the ability to solely heal her team without focusing on also damaging is what, in my opinion, defined her character. This is why I love playing her as opposed to the other healers, she fit my healing playstyle as a dedicated healer. With the rework, Mercy lost the ability to Resurrect multiple enemies with the use of her ultimate. Resurrect has been made an ability that allows her to Resurrect (or Rez) one teammate every 30 seconds. The radius has been reduced to 5 meters which means she has to be very close to the fallen teammate to Rez them. I think this may be problematic if you still choose to play her as a dedicated healer, especially if the fallen teammate has an enemy near them. This is one of the reasons why she will have to be played more offensively and aggressively in order to defend herself while she go in for the Rez. I honestly have nothing against Rez being reworked, I think in a lot of ways it encouraged players to hide with her in order to get 4-5 player Resurrections. This way of playing her (which I have never liked, never done and strongly urged people not to do) was counterproductive to her healing abilities and I understand why it was annoying to players and in need of some changes. However, Rez being an ability paired with her new ultimate ability really change her entire style of play and that is what bothers me most about the rework. So let’s get into this new ultimate ability. It’s called Valkyrie and enhances her weapons and abilities for 20 whole seconds, which feels like an eternity in FPS games. When this ultimate is activated her healing and boosting beams will chain between teammates who are close together, allowing her to heal or boost the entire team if they group with her while the ultimate is activated. She will have the ability to instantly use her Rez ability no matter what the cooldown was before the ultimate was activated and the cooldown for Rez while in Valkyrie is reduced to 10 seconds. Her Blaster will have infinite ammo, a higher fire rate and higher damage while in this mode. This right here is the problem (which I understand is being looked into after PTR feedback, which is good news) as it basically allows her to wipe out entire enemy teams within the 20 second boost she gets thanks to this ultimate. She is also able to fly freely with increased speed and the range of her Guardian Angel ability is extended. So she has the ability to fly around quickly and freely, making her hard to hit, and can eliminate enemies very easily due to a super powered blaster with unlimited ammo. There are currently videos all over the internet displaying this and honestly, after playing through these changes myself, it is not at all hard to do and feels extremely overpowered, in my opinion. On its face, this seems really awesome and I don’t expect people who currently don’t play Mercy very often or at all to fully understand how devastating this rework is (if it is kept as is). As a Mercy player, this means that we will be strongly encouraged to perform these simple team wipes and if we choose to not do this and instead heal/boost our teams we will probably be called out for playing her poorly. Of course this is situational as there will undoubtedly be times when healing/boosting is needed more, but if you can wipe the enemy team why wouldn’t you? There are also many DPS players who are already claiming they plan to play her much more now that she has greater offensive abilities, meaning that those of us who played Mercy before will have to fight just to be able to play her in most modes. That may sound selfish but there’s a bigger reason that “I wont get to play her” behind it: Those who didn’t play her before but want to play her now wont be playing her to heal/boost the team, they will be playing her to do damage. So we may or may not almost entirely lose her as a healer in the hands of many players. While these all seem like hypotheticals, I think anyone who plays this game enough and is in tune with what the community is saying/doing will realize that this isn’t unbelievable and entirely realistic. Again, if they do end up reducing her damage while in Valkyrie mode like they claim to want to do, then things may not change so drastically. But even that isn’t a perfect solution since if her damage is reduced, how is she expected to defend herself when her kit requires her to do so now? All in all, I find this rework to be extremely problematic for any reasons. Mainly because she will no longer be a dedicated healer and players will be encouraged by her kit to be more offensive than she ever has been before which again will change her entire style of play. To many people this seems like a great thing but as someone who plays her as much as I do, I am quite heartbroken and feel like in a way I am losing her as a character since she will be so different. Sure, I’ll continue to play her and I will learn her all over again, but I will always miss how she used to be. Pharmercy (A Pharah with a Mercy constantly healing/boosting her in the air) is already a huge problem, especially on console versions of the game where aiming is not as accurate. With these changes to Mercy, this combination will be more lethal than ever before as now Pharah can be Resurrected more frequently and as soon as Mercy gets her ultimate it’s game over for the enemy. Without multiple Resurrections and with the nerf to D. Va’s DM, there is nothing to counter enemy ultimates. This game will quickly turn into a game of which team can use their ultimates the fastest to win. This may seem more fun than it is now but trust me, if you are on the losing end of these matches it is anything but fun. With Mercy being played more offensively, most teams will probably find it hard to rely on her as a solo healer meaning the team will either die more often or have to run two healers. The meta, for those who follow it, will be drastically changed depending on how these two characters end up being played when this patch goes live. This may or may not be a good thing, but regardless I think we will find a problem with healers in general no matter what the meta is. Even though Mercy wasn’t part of the previous meta, with her being more offensive based she probably will be now, which will restructure the entire thing. Support players in general will probably be affected the most as there will need to be more of them in most cases (usually higher level games) and they will have to work around this Mercy rework. Again, this could be good or bad. Tank and offensive will probably be affected due to D. Va’s changes. It’s hard to say how this will happen or what exactly will be affected but I doubt things will stay the same as they are now. These changes could be good or bad, it’s hard to tell, and in some ways I think things may improve but in others I think they will degrade and possibly make the game less fun in some ways. There’s a lot to think about and I want to urge people, myself included, to keep in mind that all of this is only in PTR right now which means that changes will still be made and this isn’t necessarily the final product of either character. I’m trying my best to stay hopeful in the light of Mercy’s rework and am cherishing the fact that D. Va will be more enjoyable for me to play. I’ll do my best to keep things updated here as they change to provide the most accurate information before these changes go live. I think they’re going to have to change Mercy’s new ultimate. I don’t know why they’d add that offensive option. When I first heard about the rework I was pleased – Rez is nice, but everytime I’m told “Mercy go hide” or “Mercy, why weren’t you hiding?” I want to put my keyboard through my monitor. A single rez sounds good though. I’m pretty cool with single rez too, honestly with the way I rez it makes sense and I’m sure once I get used to it I’ll really like it. However her ult raises concerns and needs a lot of fixing, so I wonder what they will do in thr end. Playing the PTR and seeing videos of other people’s experiences makes me concerned. Honestly it seems way more OP than rez, in my opinion.